“We should ask Ammar what the traditional games played in Egypt are. 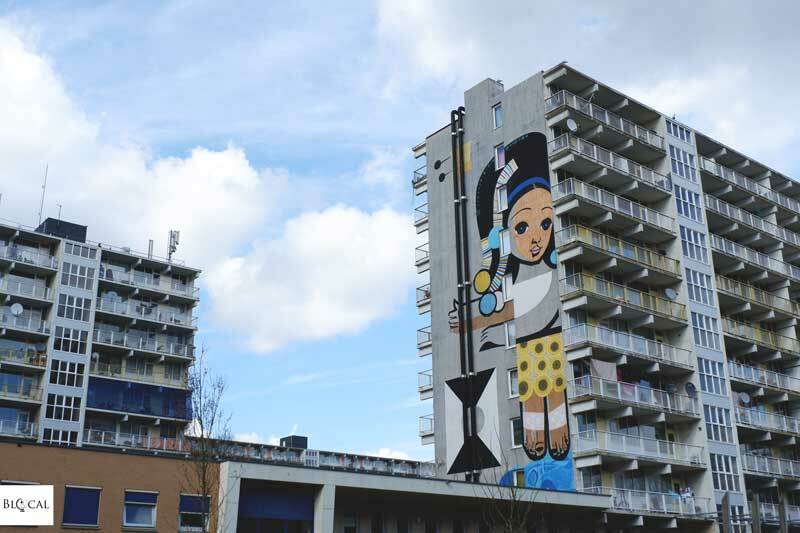 Then we teach them to the kids of Bijlmer and arrange a play-day for the vernissage of the mural” I said to Anouk while we were setting the dinner table and a full white moon was shining on the wide, iconic windows of Amsterdam’s buildings. 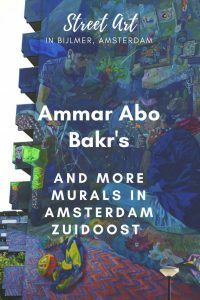 On that afternoon, Anouk had shown me the ‘ghetto of Amsterdam’ and I couldn’t get over all those kids from various ethnicities playing together, or their laughs echoing over the lake that majestically mirrored the 11-storey wall that soon would have been painted by Ammar Abo Bakr. 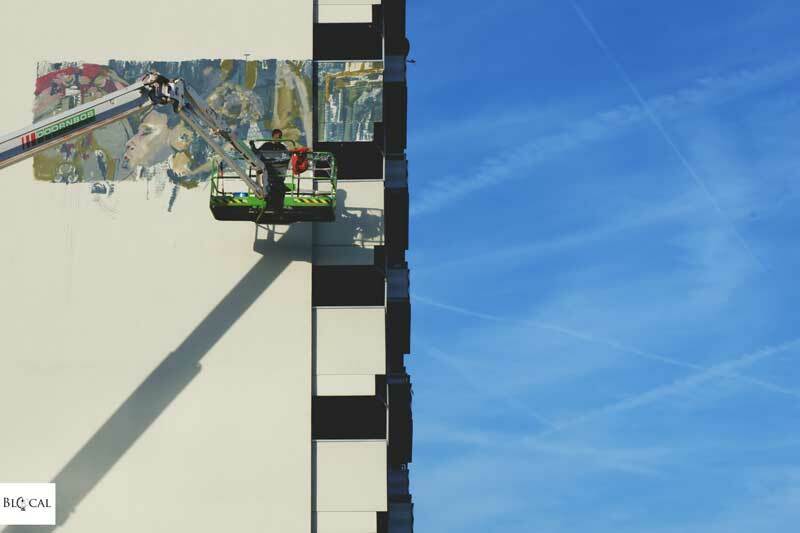 Thanks to the joint efforts of “R.U.A – Reflexo on Urban Art” and “Urban Art Now,” it was just a matter of days before that massive wall would turn into a masterpiece. I was looking forward to seeing the Egyptian muralist at work, and I wasn’t the only one. All occupants we met during our afternoon inspection stopped Anouk to raise many curious questions. With her project “R.U.A. 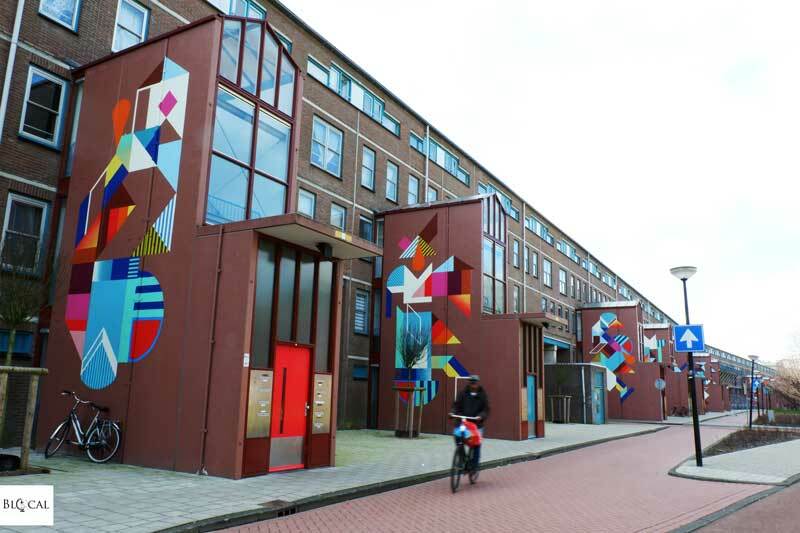 – Reflexo on Urban Art”, Anouk has been inviting artists to Bijlmer since 2011, helping them understand both the urban and social context into which they were operating and sparking a dialogue between their home country, Brazil, and the many ethnicities living in Bijlmer, which are mostly coming from former Dutch colonies -like Suriname- but also from Caribbean and West Africa. 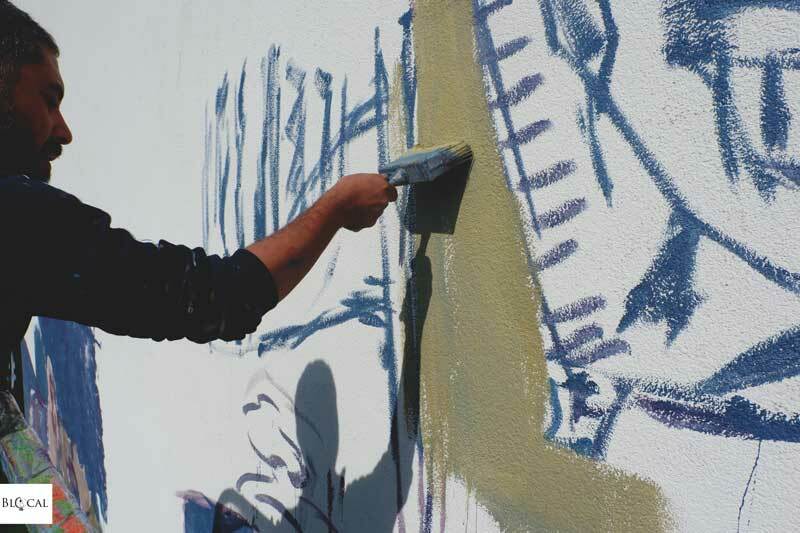 Although all residents were eager to welcome yet one more artist to their neighbourhood, they also were a bit sceptic because this artist was coming from a Muslim country. 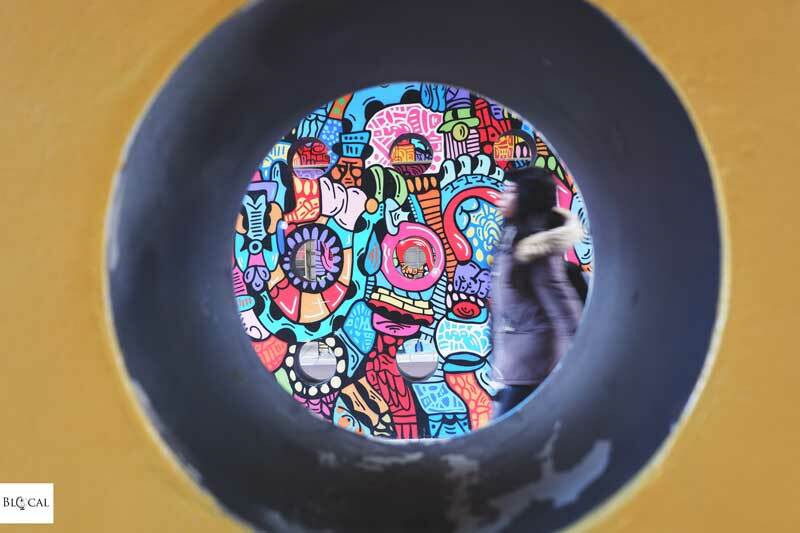 But Anouk likes to shake things up and, with Ammar Abo Bakr’s mural, she aimed at sending a welcoming message to all Muslim refugees and at showing Islam from a different point of view, by starting a dialogue that will highlight all the positive things from that region. When we first met Ammar was at the HQs, waiting for his paint. The wall was still white, and he looked a bit worried for the slow start, so he was trying to release the tension by compulsively drawing his sketch over and over again, each time diving more and more into the details. Over some Arab tunes coming from his phone, he told me that he was going to paint the exact frame of a scene of the movie he is shooting together with his friend Mohamed Hamdy, who came to Amsterdam as well. This independent movie is about the revolution in Cairo, shown through the nightmares that haunt a former leader. Even though nowadays, Egyptians want to move forward, they do feel lost as their subconscious is still stuck in those days of the popular uprising. 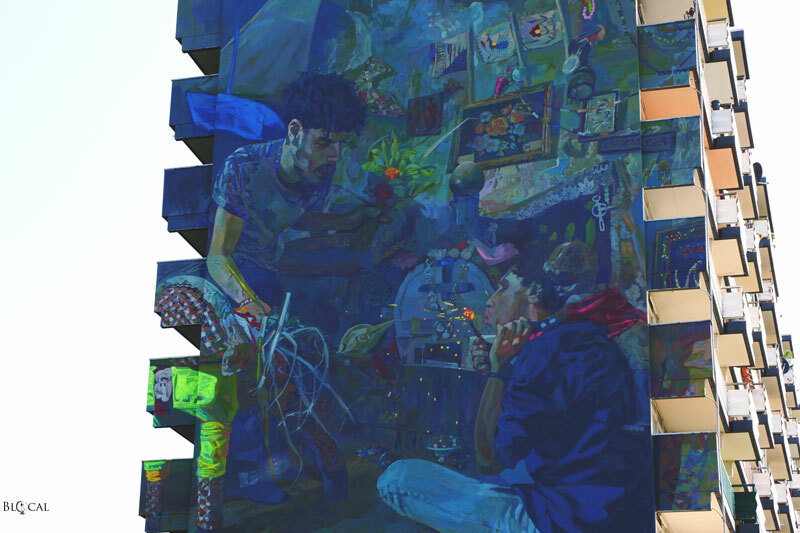 Being it the reproduction of a movie scene, Ammar Abo Bakr’s mural is highly detailed: every square meter of this 11-storey wall reclaimed his full attention, not only the two main characters in the middle of the scene –as it is usually the case with such large-scale murals. 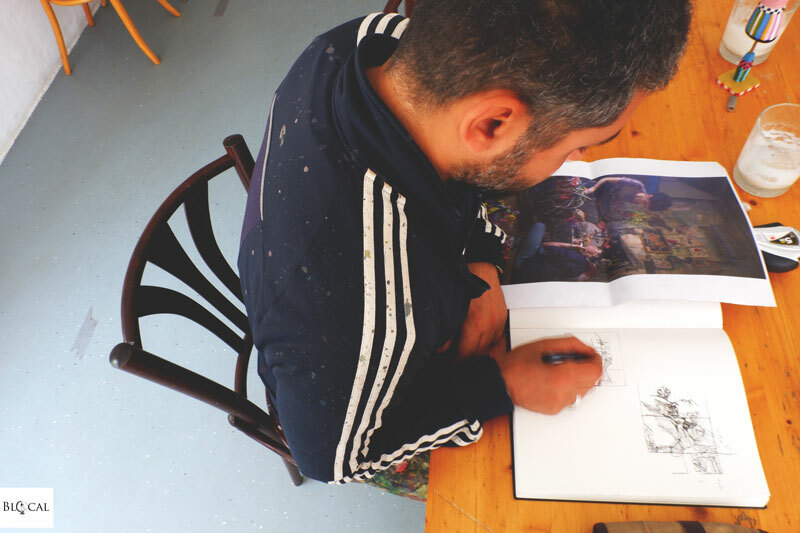 It didn’t take too long before some Arab-speaking locals approached the artist, sharing with him some juicy dates and their astonishment for the fact that, for the first time, the invited artist was from a Muslim country. More curious residents joined them and asked questions about Egypt and the movie that they were shooting there; quite shortly, a friendly bunch of people was lying on the soft grass enjoying the sunshine after a long, Dutch winter, with their eyes glued on the wall in awe. 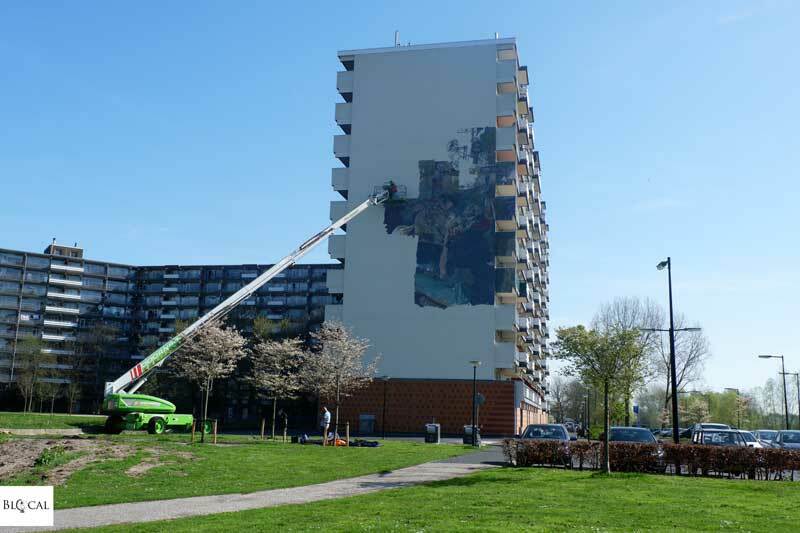 After curating the production of many large-scale murals scattered around Rotterdam and Amsterdam, R.U.A. found its home in Bijlmer, an area in the southern outskirts of Amsterdam. 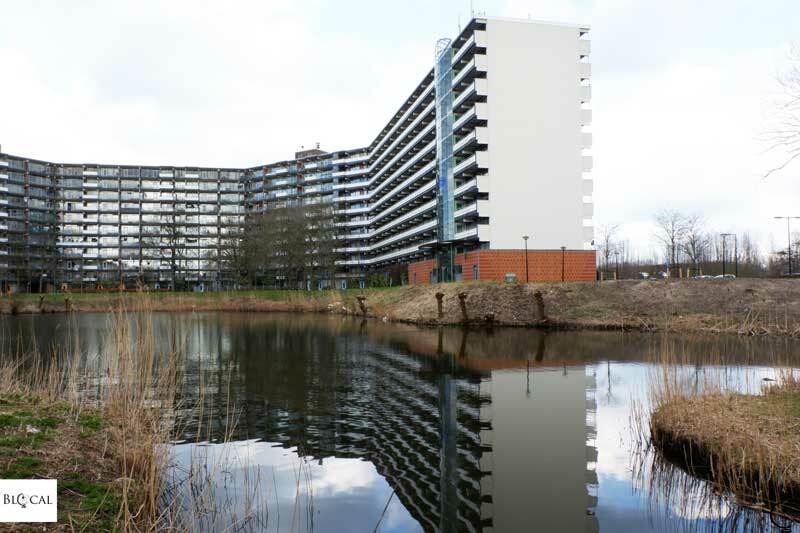 Bijlmer was built in the 1960s with an ambitious architectonic utopian plan that envisioned it as an area for higher middle-class Dutch people looking for green and comfort on the outskirts of Amsterdam. However, this architectonic experiment happened to be a big failure because the area lacked facilities and was isolated from the rest of the city. These mass 11-storey high concrete vacant buildings were then allocated to immigrants and the stigma of ‘ghetto’ followed shortly, implying high unemployment and crime rates, social exclusion, poverty, and segregation. 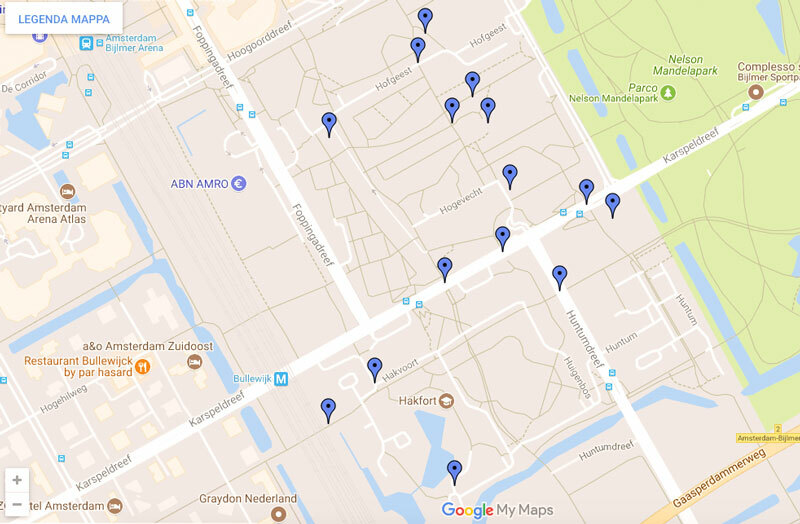 Although things have changed since the 90’s, the negative stigma stayed and most Amsterdam residents are still unaware of how lively green and open the Bijlmer actually is. 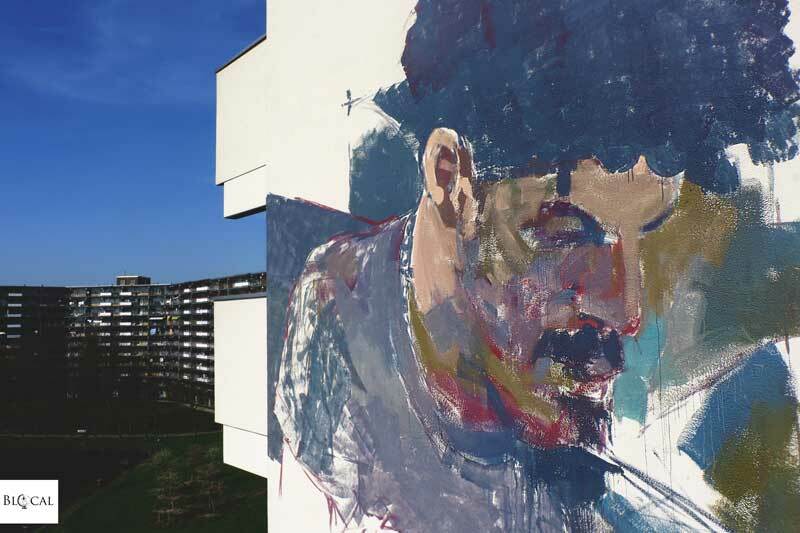 Thanks to the resident community of creative people, the melting-pot of different nationalities and lots of art projects going on, among which R.U.A., which has been inviting artists to live, create and paint in Bijlmer since 2011. 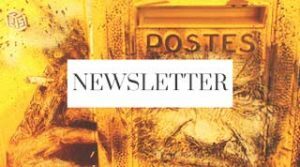 Dalata’s artwork revolves around the idea of broken and forgotten pieces of nature or urban objects, to which he adds a positive spin by creating abstract art and surreal sceneries using the fundamental brokenness of the object to show its fragile yet strong potential for beauty. 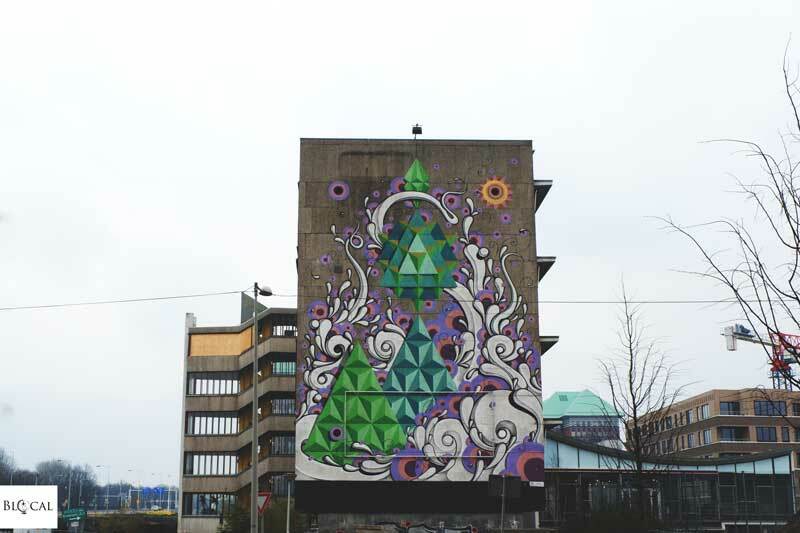 This approach to art as a way to bring out the hidden beauty of something neglected made him the perfect artist to kick off the transformation of Bijlmer back in 2011, from a no-go area to the dynamic artists’ community that it is today. Dalata was the first artist invited by R.U.A. 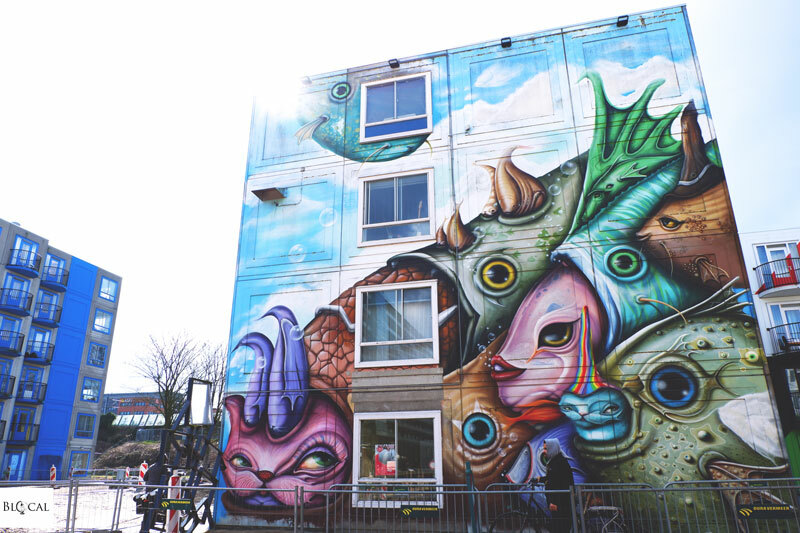 to this forgotten area of Amsterdam, where he painted a beautiful mural featuring his iconic surreal cat-looking fish that still stands at the entrance of the neighbourhood, as a colorful and playful welcome sign. Derlon’s art is strongly influenced by the traditional woodcutting culture in the north-east of Brazil (Pernambucan region, the area where he is from), which was one of the primary vehicles of popular communication in Brazil before modern communication system emerged. 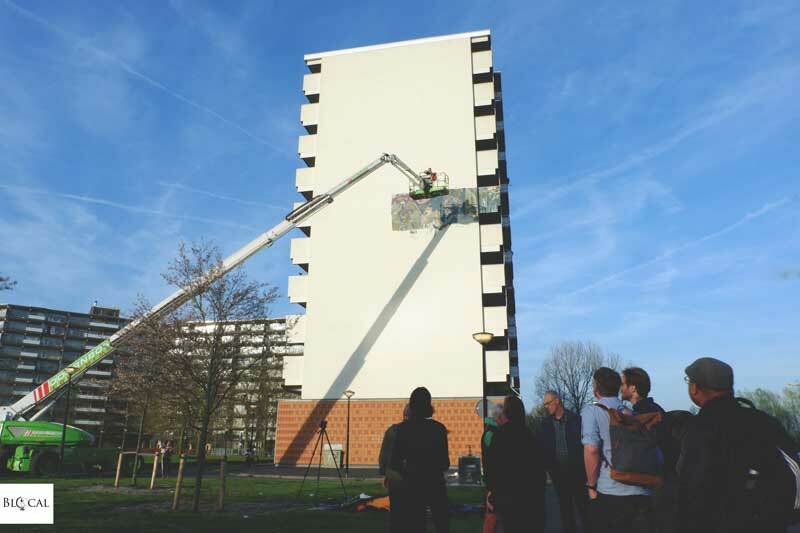 When he came to Amsterdam back in 2012, he led a series of workshops with locals kids to show them these traditional woodcutting techniques that inspired the huge mural he painted for R.U.A. on a 12-storey building. 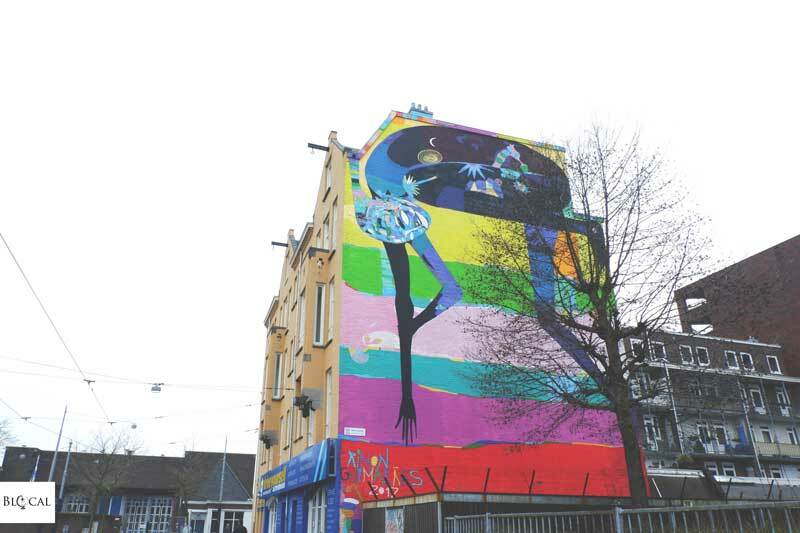 This mural depicts his iconic black-and-white figures highlighted by strong primary colors. Gais Ama began tagging the streets of Rio de Janeiro in 1995. 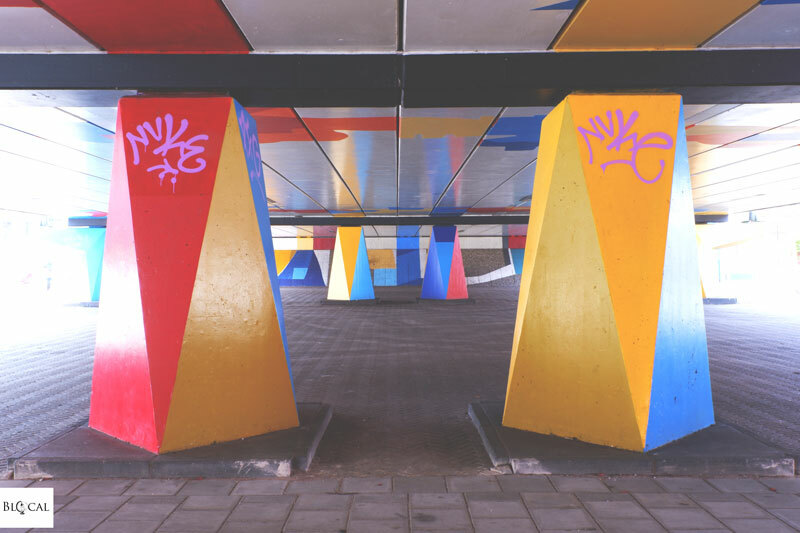 His public art pieces integrate abstract modernist influences into his graffiti background, and he often plays with a combination of geometric and organic color shapes and planes of lines. Realized in 2014, his artwork for R.U.A. was inspired by a series of workshops with local kids, who wanted to color-wash a viaduct in the area, which since then has become a popular public place for locals of all ages to enjoy. Speto is a legendary graffiti artist from Sao Paulo: he began tagging in the 1980s, and he works as an illustrator as well. His unique style is characterized by traditional folkloric Brazilian art mixed with hip-hop influences, tattoos, wood carving prints and many more cultural elements coming from Brazil, especially “The Cordel” style (Brazilian popular and inexpensively printed booklets containing folk novels, poems, and songs). 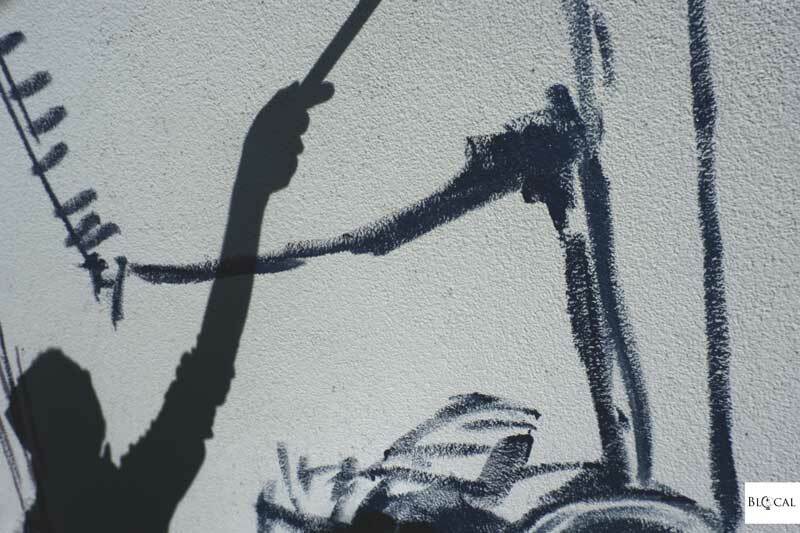 Speto’s iconic characters are simple and playful, like the young lady he painted in 2014 for R.U.A., tributing the music school on which wall he painted. I love the way he incorporated the water pipes as the strings of the instrument! Ramon’s kaleidoscopic universe mirrors a deep and abundant essence, rebelliously styled by a street culture repertoire and combined with academic reflections. 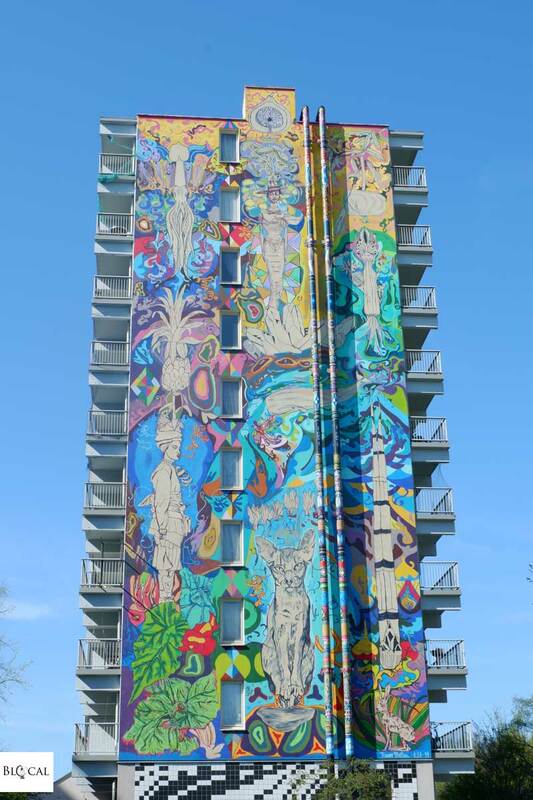 The colorful mural he painted for R.U.A. in 2014 is among my favorite walls in Amsterdam. It is titled “A pregnant man’s dream” since it is inspired by his wish to empathize with his girlfriend, who was pregnant at that time. 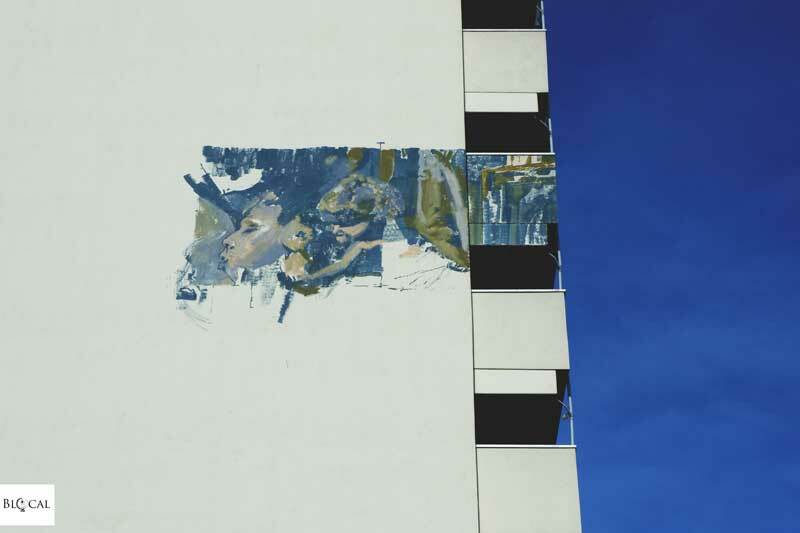 For Raimon, to paint such a large-scale mural is similar to giving birth: it implies a months-long preparation phase followed by the physical challenges of actually painting a 35-meter high building. 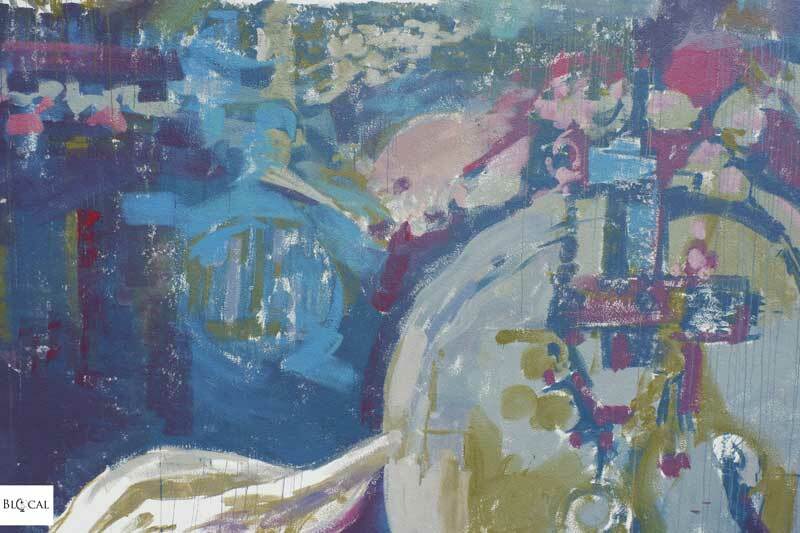 The artist associates pregnancy with water, since the baby grows in a bag of water, and this is why the figures he painted in this mural are connected to each other by organic fluid forms. The three principal figures are like tribal totems, of which the tallest one –the one in the middle- represents an African queen. 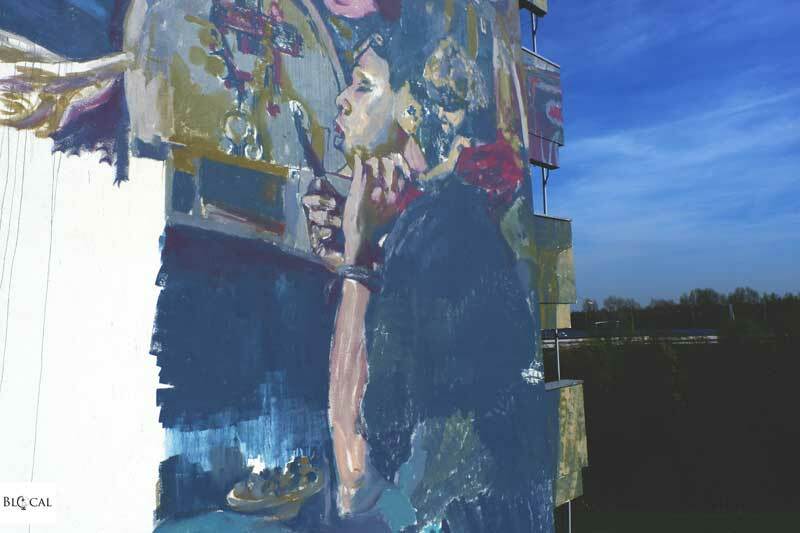 Rimon Guimarães had already painted in Amsterdam back in 2012 when R.U.A. 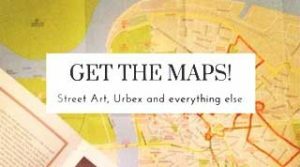 commissioned him a large mural in the western area of the city (see below). This contemporary artist from Brazil is well-known all around the world for his mystical figures and faces, mask-like characters in bright colors and patterns. 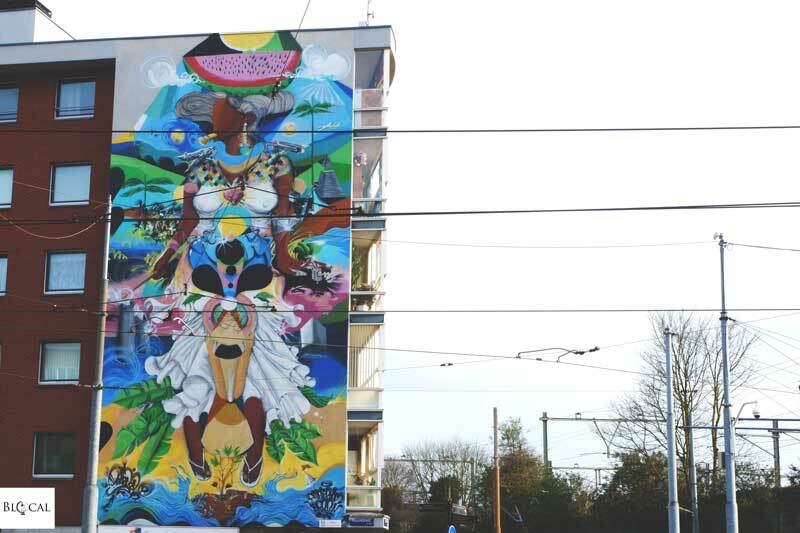 Rimon’s art is influenced by the African diasporic traditions in his native country, with his murals often recalling the colorful pattern dresses of African women. Back in 2014, he painted for R.U.A. 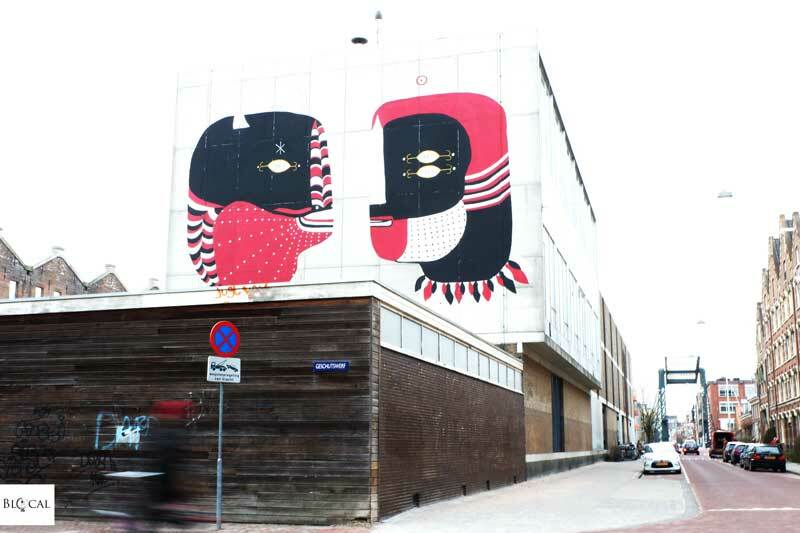 a mural inspired by his travels to Gambia, a powerful wall that is still spreading joy and vibrant all around Bijlmer. The work of the Spanish artist Ovni is dominated by colorful and abstract internal landscapes that live in the imaginary space, on the border between the two and three-dimensions. Her metaphorical reflections on the surroundings provoke emotions in the viewers by evoking inner landscapes. 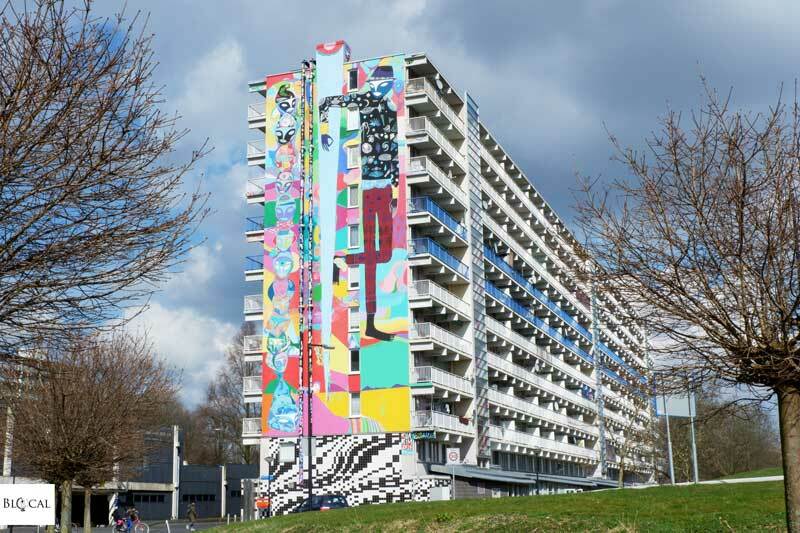 In Amsterdam, Ovni painted a highly interactive piece made of 26 murals on a row, which were designed by residents through an inclusive online game. 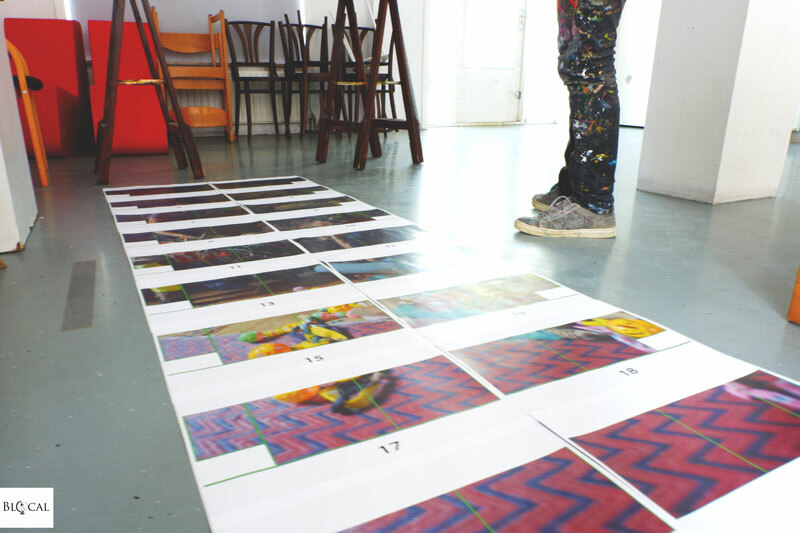 The game consisted in dragging and dropping 20 geometric forms and shapes in different colours into a virtual canvas of the scaled size of a mural of Hoptille. The mosaic-like paintings and drawings by this Brazilian graffiti artist aim at representing the chaos of society. Onio’s art contains an endless amount of stories told in detailed lines and forms, figures and characters, which from afar appear like abstract color patterns. Back in 2014, he painted two “passages” that locals walk through -or, most likely, bike through- every day. These “passages” had an essential role in the utopian architectural plan of the area, according to which trains, metro, cars, bikes, and pedestrians should have been separated from each other. 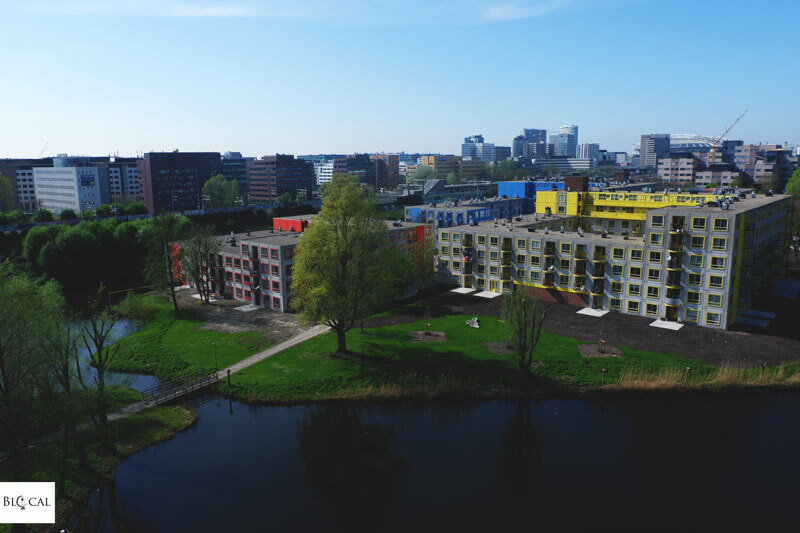 However, this system of dark tunnels, viaducts, and hidden areas only helped illegal transactions and the flourishing of an informal economic sector in H-Buurt, while locals felt unsafe and thus refused to use those spaces. 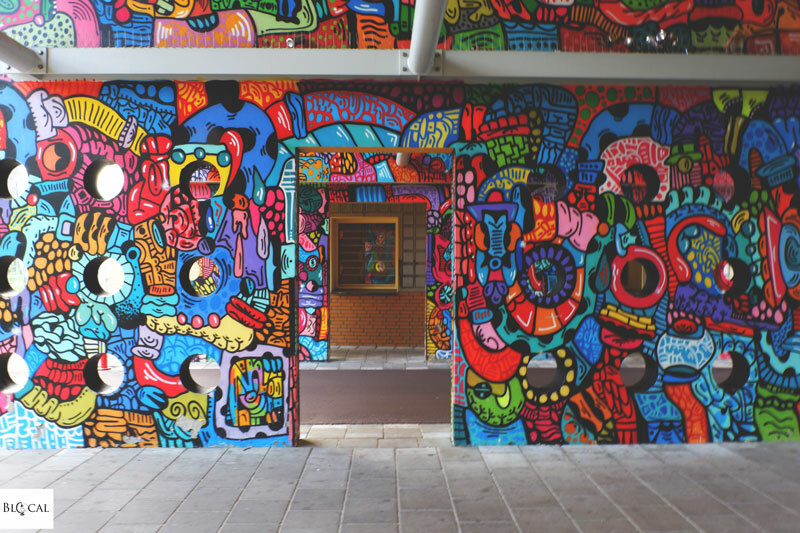 Today, however, residents are delighted when they walk through Onio’s passages since they are entering an actual piece of art, whose birth they witnessed. Onio’s iconic vivid colors brightened up the smile on local faces, allowing them to take back the area where they live. Rafael Calazans Pierri a.k.a. 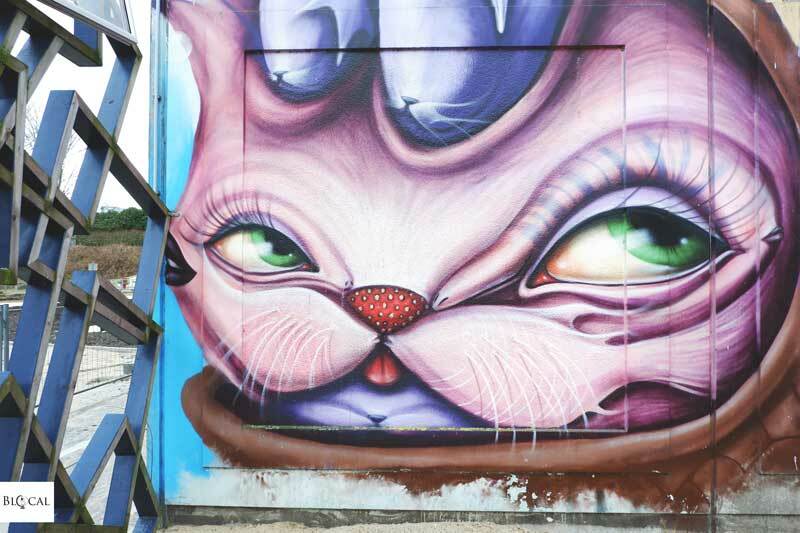 Highraff began painting in the streets of Sao Paulo in the 1990s, and he has been tagging as ‘highraff’ since 2004. From his background in graffiti, Highraff created an iconic style that is inspired by nature and the four natural elements. In the large-scale mural he painted for R.U.A. back in 2012 there is another of his typical traits: the compositions of geometric shapes, which have some sort of sacred and symbolic meanings in accordance with the purpose of his art, which is to suggest different ways to interpret reality. This Mexican-Brazilian woman who has been invited to paint on the streets of Amsterdam back in 2012 is also an internationally acclaimed fine artist, a singer, and a dancer. Fefe’s colorful monsters express the feelings and longings hidden in darker parts of ourselves, our fears and aggression. For R.U.A. 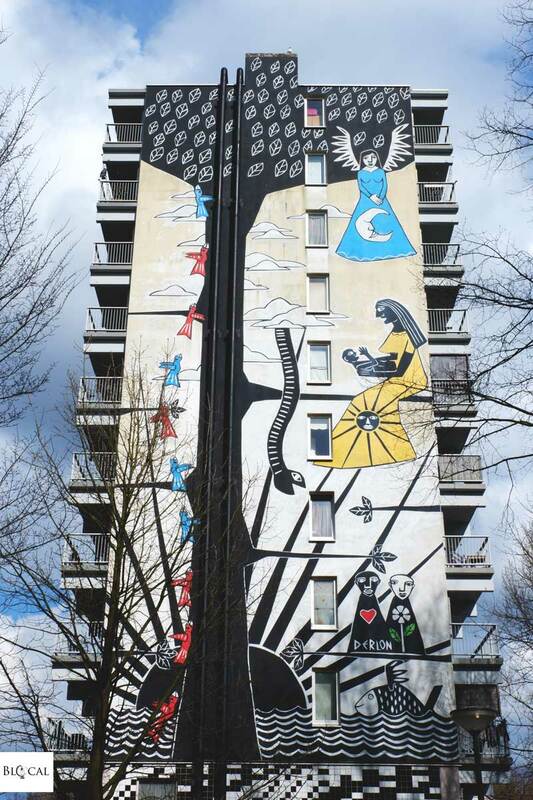 she painted one of the most iconic murals in Amsterdam: it depicts two of her typical tribal characters, who represent Brazilian Indians wearing animal masks as part of a local protest against big utility companies. 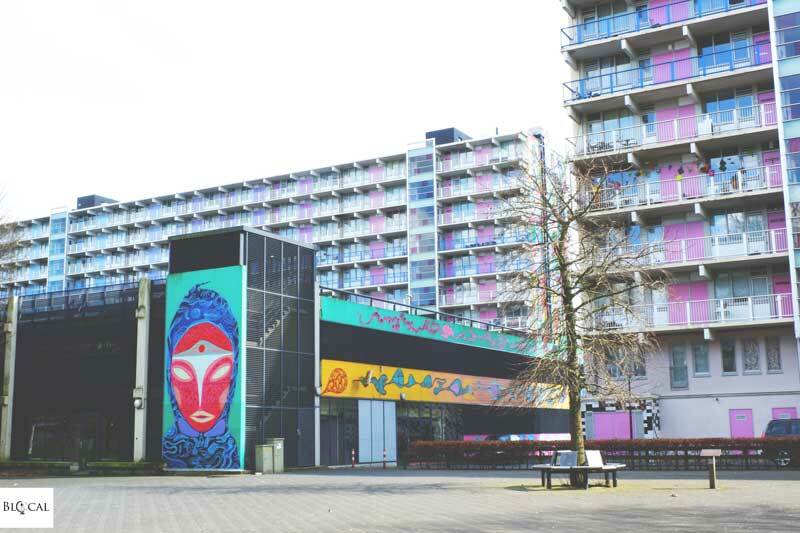 Back in 2012, Diogo Dedablio painted one of his iconic colorful Brazilian characters on a huge wall in Indische Buurt, an area that is home to a large migrant community, mostly from Suriname. 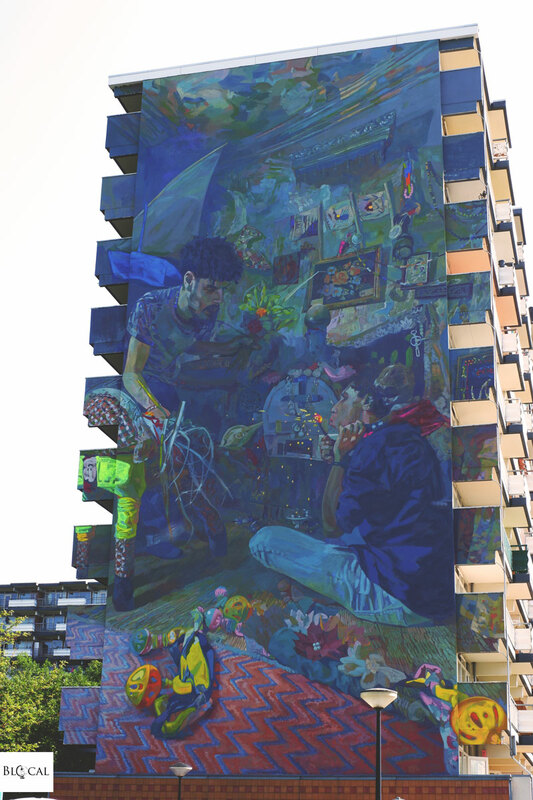 Dedablio’s mural explores the connection between this multicultural area and his home country: Brazil. What I like about this wall is the joy and the passion of life that it spreads all around the neighborhood.